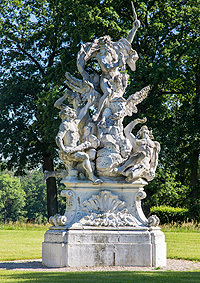 Lothar Franz von Schönborn, elected Prince Bishop of Bamberg in 1693, designated an area of 21 ha of land with adjacent lakes and forests to be made into gardens, axial to the yet unfinished summer palace. The Prince Bishop had the palace hill reshaped into precise terraces and the gardens divided into six large sections. He thereby created the garden structure that has remained until the present, which is exceptional in style on account of it being more reminiscent of Italian or Dutch parks, rather than the more customary French ideals. 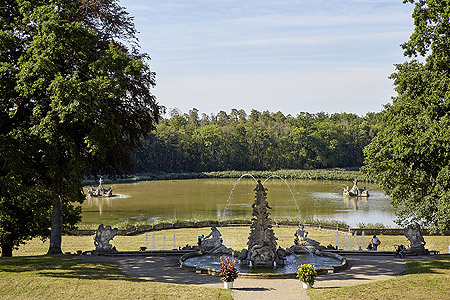 Prince Bishop Adam Friedrich von Seinsheim (1757-79) moved the cascade to the south and created a labyrinth. 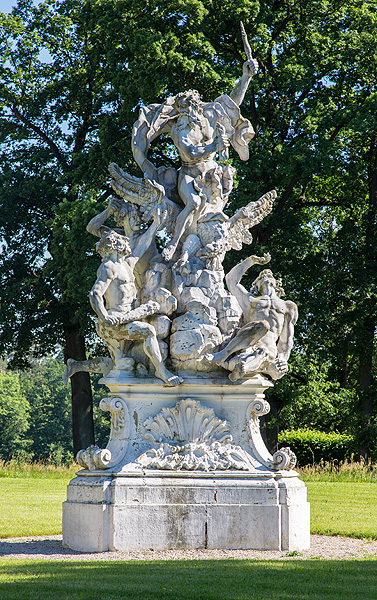 This was completed by the garden's decorative embellishment with 400 sculptures by Ferdinand Tietz, hardly any of which have survived until the present. A chestnut avenue from 1797, used to lead beyond the enclosing walls to the Schweizerei (dairy) in the east and the pheasantry in the west. The chestnut avenue and linden tree avenues framing the gardens and the "tapis verts", have been replanted during are the old hornbeam hedges along the pergola walk, and the lime tree groves. Central to the garden is the cascade created in 1772, which dilapidated increasingly after secularisation and was put back into operation in 1995. Its programme heralds the glory of Hercules, in allegory of the Prince Bishop's glory. Dogs may be taken into the palace park if kept on the lead. It is not allowed to have picnics in the park.